Castleford Tigers boss Daryl Powell is keen for his team to build some momentum ahead of the Super League play-offs, beginning with tomorrow night’s game at Huddersfield Giants. 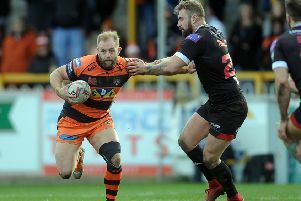 The first game after clinching the League Leaders’ Shield will test the Tigers’ ability to refocus after their first objective has been achieved, but Powell reckons the players are ready to go again. He said: “We have changed our training a bit, just trying to create some more intensity in what we’re doing. “We are only doing short sessions, but there’s an edge to what we are doing, putting ourselves under a bit more pressure, so that has been going well. “But we are going all right, we have had a good season and there’s a lot of confidence about us. “We know we will be challenged in these last four games before we come to play-off time and we are trying to create some momentum. A mini training camp in Newcastle last week helped the head coach get across his message that there is still a huge amount to play for. Powell said: “We had a couple of days in Newcastle last week, training in camp, which I thought was good for us. “We have trained well this week and looked pretty sharp, so I think the break has been good for us. “You want to be involved in the Challenge Cup final, but if you are not it probably does benefit you in some ways after such a long season. “Old Trafford is a pretty special place to play because of the atmosphere generated there so the players will want to savour that kind of atmosphere. “To be able to do that we have got to finish our season off well. Powell is expecting a tough game at the John Smith’s Stadium against a Huddersfield side desperate for victory to keep their hopes alive of reaching the play-offs. He added: “They are defending well and playing a lot more expansively than they were earlier in the season. “Brough’s running laterally and creating a lot of trouble for teams. Gaskell’s playing well, Rankin’s a threat and they’ve a couple of players in the pack who are really explosive – Ikahihifo and Ta’ai. “They are a couple of tidy players and Leeming’s playing well at nine. McGillvary’s playing really well on the wing – they are a good side at the moment and they will be confident.